In a heavy-bottomed pot or dutch oven, brown bacon over medium heat until crispy. Using a slotted spoon, remove bacon and let drain on a paper towel-lined plate. Pour off all but 1 Tablespoon bacon grease. Add onion, carrot, and celery to pot and saute until veggies are tender. Add potatoes and toss to coat with bacon drippings. Add enough milk to completely cover the potatoes. Mix cornstarch with 1 more cup milk and add to pot. Simmer until thickened, 1-2 minutes. If you want the chowder thicker, mix another Tablespoon of cornstarch with a few Tablespoons of milk and add it to the pot. 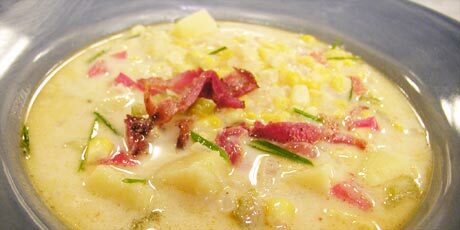 Add fresh corn and bacon and heat through. Season to taste and serve hot!